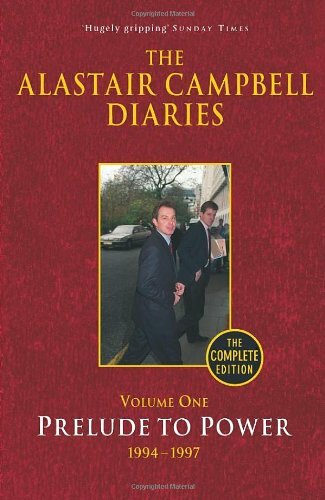 Alastair Campbell is a British journalist, broadcaster, political aide and author. He is editor at large of The New European and chief interviewer for GQ magazine. 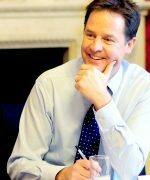 He is best known for his work as Tony Blair's spokesman and campaign director (1994–1997), followed by Downing Street Press Secretary (1997–2000), for Labour Prime Minister Tony Blair. He then became Director of Communications for the Labour Party (2000–2003). You start with this famous study of Abe Lincoln. This is just about the best book on politics I’ve ever read. 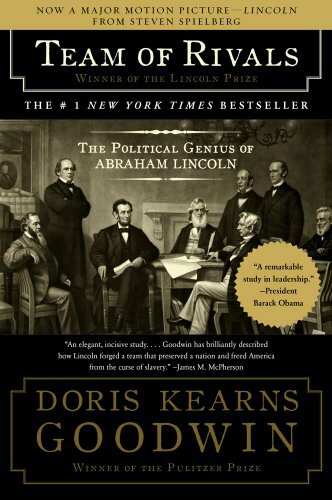 You have to be a bit careful because with somebody like Lincoln there is such mass of material out there, but what Doris Kearns Goodwin has managed to do is to give it a freshness and a depth that is very rare – it’s an unputdownable historical account. Just think about campaigning for the presidency of the United States. In the television age, and with aeroplanes and all the rest of it, it’s quite straightforward but it’s still bloody hard. It’s incredibly gruelling. Well, these guys are spending all their time travelling. Some of the most extraordinary things she gets are actually in the letters they write. Today, if you’ve got a message to deliver you go on the telly or you buy an advertising spot or something. These guys used to write to people: literally, ‘Dear Mr Bloggs, I am blah blah…’ Then, of course, they would have these big public meetings and they would often be in the same areas – they were always sleeping in the same rooms and talking about their affection for one another. This was a totally different political era where the relationships between the political figures themselves were so much richer and more entwined. I mean, imagine before the TV debates if Brown, Cameron and Clegg had been sharing a room. There’s an amazing account of the nomination campaign of these three: William Seward, Salmon Chase, and Edward Bates. If you had had political bookmakers back then, Lincoln would have been fourth favourite. 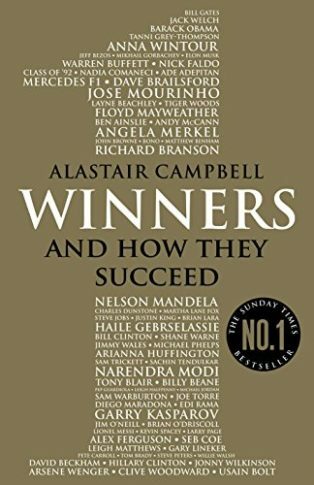 This has an incredibly detailed account of how he turned it round and how he won. And then he gave all the top jobs to his rivals, like Obama in making Hillary Clinton Secretary of State. Isn’t this famously Obama’s top book choice? Yes, he said if he had to take only one book into the White House this would be it – although he also chose the Bible, which they always have to say. So Seward became Secretary of State, Bates became Attorney General, and Chase became Treasury Secretary. And then this other bloke Stanton, who had been vile about Abe Lincoln, used to call him a baboon and a long-armed ape and all this sort of stuff, he became Secretary of War. So he built his team around them. And then during his presidency, particularly at the time when the country was in a state of civil war, his political genius, as the book calls it, was holding all these factions together. Now, some of them he gets rid of. Chase kept threatening to resign and in the end he called his bluff and got rid of him. Basically, Lincoln got the nomination and Chase thought it might not go so well so he kept manoeuvring to get the nomination next time around, and eventually Lincoln got rid of him. But the rest of them adored him. Obama has a trajectory going in the other direction? Yes. And Lincoln was dealing with a collection of such difficult issues. There is so much detail in the book about him and his family. And again, which interests me, he was a depressive. She’s got a lot about that, about his moods and his melancholia, as they called it. It’s funny, I often wonder about these guys when they were part of it, whether they knew how history would be written. If you say to most people ‘Lincoln’ they will know. But Seward, Chase and Bates? Lincoln has become the figure in history for that period and yet they were a very, very important part of what he achieved. And the whole idea about leadership, I think, is not just about the leader but about the team that you build and how you use the different skills of the people around you. And there are an awful lot of lessons in it for people in politics today. And, as with Churchill, another depressive, how would he have coped now? It is interesting to speculate what Churchill would have been like with the 24-hour media. What would Lincoln have been like? It has created this extra layer. Because what you get from this and from the Churchill biographies is the sheer scale of stuff that they are dealing with at all times. Now, so are modern politicians, but we look at them in a completely different way because there is this bloody television blaring away 24 hours a day. If somebody brings in their rivals, it is often seen as a clever tactic but you are arguing that it is actually a good idea to bind those people together for the sake of their strengths? Partly, people get strength within an organisation by challenging or by standing for leader, then they win a place in the leader’s team of rivals. But what was interesting about Lincoln is that he was very much the underdog. Now they talk about ‘the Lincoln league’ meaning the top presidents of all time. But you read here about his demeanour and his style in his early political career and you think there is something missing – but then he became this great historical figure. Do you think that in our age – you mentioned the influence of modern media – someone with those gentler qualities could succeed? You said Lincoln’s political genius emerged over time. So much of it seems to be about personal charm, which has its limits. Lincoln could clearly command an audience but in a very different way. I hope there is still room for that kind of slightly quirky character to come through and then emerge as something very special – but I do think it’s harder now. We are narrowing the political gene pool in a way that is dangerous. And this whole post-expenses thing in Britain is in danger of making politics just a game for the rich again. Your next choice is Gorbachev. If you look at Obama, part of what made him a huge success as a campaigner in opposition was his books, partly because of the way they described his background but also his political views. I cannot remember whether this book by Gorbachev, which came out in 1987 while he was General Secretary of the Communist Party, I cannot remember whether it had an impact at the time. 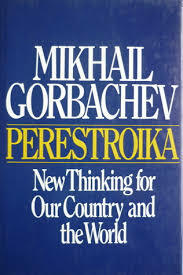 It is called Perestroika: New Thinking for Our Country and the World. Now this is nothing like Obama’s Dreams from my Father at all. Insofar as it is autobiographical it describes meetings he has had with various different leaders round the world. This edition is 254 pages and it doesn’t let up. It’s almost like a never-ending speech. There is no light and shade and no ‘Hold on while I tell you about my childhood’, none of that at all. But the reason I wanted to pick it is that politicians with really big ideas are still the means by which a huge amount of change in the world is driven. It is fabulous that two Russian words, perestroika and glasnost, entered the global language as a result of one leader, Gorbachev, deciding he wanted to change his country. There are lots of bits where he is talking up Marxist-Leninist thinking, and yet the impact of everything that he did – the end of the Cold War, the collapse of the Soviet Union, the arrival of a market economy in Russia – was against that. So I can remember reading it at the time and thinking it was a rare book with a really big idea in it. Obviously he was passionate about more openness and about political and economic restructuring, but I would love to know, did he want it to lead to the break up of the Soviet Union and all these other countries breaking away? Maybe he did, I don’t know. Did he imagine that he would have extraordinary political success but all this economic mess, which ultimately allowed Yeltsin to come in and say, ‘This guy is not moving fast enough’? Could it not have been a genuine moment on his own journey? To make the changes to protect socialism? Yes, maybe so. 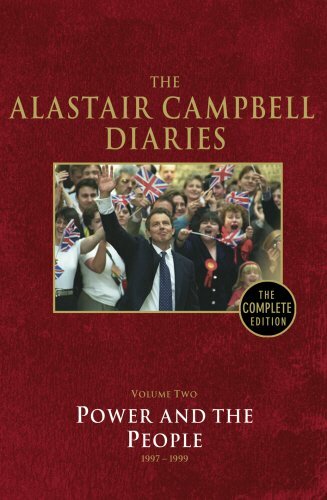 The other question you ask reading it now, is, as a political leader managing a massive process of change, to what extent is he actually using the book as part of that process? There is a lot in here to frighten the Communist horses, but the tone towards Lenin and Marx is very respectful and he’s maybe at points just slightly pulling his punches. Back then I think I reviewed it and I remember thinking this is a big figure and a big moment. But reading it now you think, wow, the world has changed so much, the former Eastern Bloc has changed so much, and a lot of it is because of this man, and you can see this book as such a building block towards it. Yet he is not terribly popular in his own country. OK, Russia is a much more open country today but the openness they’ve got is not exactly what he had in mind with glasnost. History will be kinder than the Russian people are now. Yes, I’m sure of it. He is a global historical figure. My point here is we are talking about living people and how they become history. So we talk about Lincoln, where the historical judgement is overwhelmingly positive, and over time more and more books get written and a sort of truth develops. I was in Ireland last week and if you talk about what we [the Labour government under Tony Blair] did in Northern Ireland, that will become a very big part of history. But the other reason why I wanted to choose this, a book written in the first person by a political figure, is because I think their own words become incredibly important in the writing and analysis of history. A lot of the best stuff in Doris Kearns Goodwin’s book is those letters. And I had forgotten the extent to which right from the start his vision was for a nuclear-free world where countries don’t go to war. And the nuclear issue is still unresolved, of course. Here’s a good bit: ‘I had a sharp debate on the issue with Mrs Thatcher. She claimed that for Britain nuclear weapons were the sole means of assuring its security in the event of a conventional war. This is a philosophy of doom… Have you ever thought what you look like in the eyes of world public opinion?’ So you get little moments of colour like that in amongst the philosophical stuff. A book in a leader’s own words, yes, but so different from Obama’s very writerly, very, should we even say, ‘bourgeois individualist’ books. But back then, there was already a sense of a cult of the personality about Gorbachev, which was probably frowned upon. Obama was an exception till he became president but there is such a downer on politicians. If you look at that period so much of what happened was down to one man having a big vision. Right. We are now segueing into sports – remind me why? I’m interested in leadership and it most obviously counts in politics, but it’s also very important in sport. 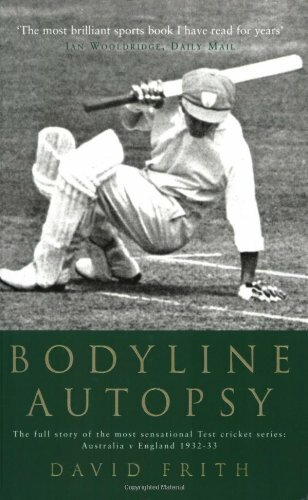 And the reason I chose Bodyline Autopsy, is because this is the nearest you’ll get to cricket history. A bit like Team of Rivals, Frith has talked to everybody, read everything, looked at everything from every possible angle and has then written what is probably a very fair and balanced account of the most extraordinary Ashes series ever. The main characters were Douglas Jardine, the English captain, who really didn’t like Australians, which was partly to do with personality and class – they were the young upstarts and we were the Mother of the Commonwealth and all that. There’s Don Bradman, the greatest batsman of all time. And Jardine worked out that to win they basically had to concentrate on him, and came up with Bodyline or what he called fast-leg theory bowling, in large part to deal with Bradman. The other character is Harold Larwood, working class, from a mining background, quite self-effacing in his own way but also a leader. He was a shy, quite modest man. The Duncan Hamilton biography has some amazing stories about how when he was playing for Nottinghamshire he was not quite easily lead, but he was not the strongest character, and yet he became a leader. We loved the Bodyline television miniseries in our house. It was compelling. It was fantastic but it was done totally from an Australian perspective. This is one of the great sporting stories of all time and an incredible controversy. The whole class thing, which is partly what the Anglo-Australian background was about, was writ large within the England team and within the series as a whole. So it becomes a fascinating historical, social study as well. And Larwood refused to apologise; he never played for England again, and eventually he emigrated to Australia. And David Frith obviously loves cricket, and this is balanced, unlike the TV series. It was an Australian journalist who coined the term ‘bodyline’, which Jardine hated because they always denied they were bowling at the player to hurt them. They said they were bowling at the player to force them to play the ball in a certain way so that the ball would then drop to these six or seven guys clustered on the leg side. The other thing about leadership, history and all that, in a sense the England guys broke the mould. Back then in the 1930s they didn’t even wear protection. They didn’t have enough headgear – there was one guy there who fractured his skull. A hard thing, a cricket ball. So in terms of leadership, why was this moment so crucial? Was it about being more aggressive? It is understanding that ultimately, at that level, sport is about winning. You had the whole gentleman versus players thing. But Jardine said, we’re here to win. In terms of strategy this is the great thing: he said focus on the strongest part of your opponent not on their weakest part. Bradman was the Australian team’s strongest part so they worked on him. So I think that sense of leadership in a team sport, even with all the impact and controversy about their strategy at the time, I think that can be justified. I think politics can learn a lot from sport and sport can learn a lot from politics. And I think business can learn a lot from both. So working on a strategy that tackles the main strength in your opponents, is that the right approach in politics? In order to compete on that territory or to attack and pick it apart, challenge it? In order to understand it and work it out. Labour was too slow to recognise that because we saw her as we saw her, we failed to see that there was another way of looking at her and that was how a lot of people, our people started to look at her: strong, making change. You say that people start to believe their line on an opponent. They also forget to notice when it is no longer so true. The lesson is never ever underestimate your opponent. I think in politics people do that quite a lot. To cycling and Lance Armstrong. Every Second Counts is his second book. The first was about his cancer. In a sense this one, although it’s his story and very personal, it is also about the team building. Because it describes how he took himself, post-cancer, having already won the Tour de France once by then, how he then built himself and the team around him. Most people would just see him and say, ‘Oh yeah, there’s Lance Armstrong on a bike and he cycles faster than the rest of them.’ But around that there is an extraordinary team thing going on. Now he has lost since then, he’s lost the Tour de France. But back then I think I saw him when he was about to win his fifth, and I think he really meant that, that he was so obsessed with it, that the will to live that he had when he had cancer was easily matched by the will to win that he had. There’s a lot about the drugs in there too. It’s co-written, which is annoying, but I’ll forgive him that. Having met him, the book gives you a real sense of why he is like he is and why that makes him special, but then around him he has this whole satellite of people and organisation that make up his team. I think understanding that is important even in a great individual sport with a great individual. 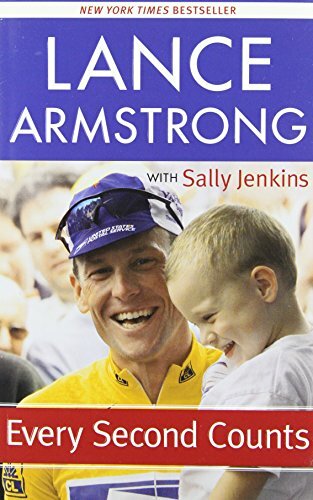 The Bodyline book is a story about leadership in a team sport and Lance’s book is about a great individual in a sport that is, although not obviously a team sport, also about the team. Again, there are lessons from it for other works of life. OK, but what about this will to win, being so driven that losing equates to dying: we are all going to die, right? So is this a psychological trick you play on yourself? Or do you have to do that over a contracted time horizon, if you have to win in a competitive sport or in politics if you have to win an election? I can remember in some of the campaigns or in some of the crises we had having a feeling deep, deep, deep in the pit of your stomach that said, ‘We have to do something about this. This is critical.’ And there is a link there to the basic will to live – a combination of fear, hope, power, impotence, it’s all in there. But I can remember, often in the key moments when we would suddenly crank through the gears and get into a different level of operation, it was when we felt fear. Like an army at bay? Yes, but the leaders will be the ones who felt it deepest and used it to act most. If you go through my diaries it is interesting the number of times both in campaigns and in crises in government, there is a moment when the key people are all feeling this thing in their gut – it’s not panic, but they are all feeling this thing, and it’s really powerful and really strong and you have to make change to deal with it or you go under. So I get that, that losing is like dying. It’s all quite addictive though, isn’t it, this high stakes adrenaline rush? I think that sometimes fear of losing, fear of defeat, whether in sport, in politics, in business, is what forces you to go really deep into yourself and find the reserves that you need. In a boxing match, sometimes you can see where the guy who is losing summons up reserves of energy and skill and power, and he overturns the other. It doesn’t always happen but it happens quite a lot. And that then is about a stronger mentality. Doesn’t Lance Armstrong have some sort of biological advantage? A lot of them have – cyclists have notoriously low pulse rates, for example. But in Every Second Counts it’s that they analyse everything, there is no detail so small that it’s not worth studying whether you can change it slightly to improve performance. And the thing about the cancer is that it made him more conscious of the limitations of his body but it also made him conscious, because he recovered, of the power of the human body. The other thing that he said in my interview was that the reason he wins is because he can endure more pain than the others. When you see those guys going flat out for 12 hours…they are pretty amazing. It makes me feel unwell just to thing about it. What is your final book choice? 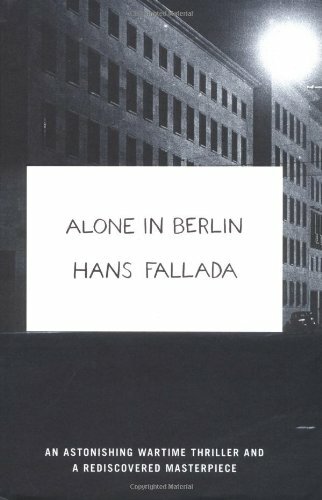 So I wanted to have political leadership, sporting leadership and a novel to demonstrate moral leadership: I have chosen a German novel variously translated as Alone in Berlin or Every Man Dies Alone, and it’s by Hans Fallada. So Germany’s leader at the time of this book is Hitler. But it’s the story of this very very ordinary couple, he’s called Otto Quangel and his wife is called Anna. They are not actually ideologically counter to the Nazis, they just try to get on with their lives but their son, Ottochen, is killed fighting in the war, and the dad starts this thing where he writes anti-Nazi postcards and leaves them in stairwells. It sounds mundane but it is extraordinarily fraught because it’s a police state and you’re not allowed to criticise the regime. And eventually he brings his wife in on it and it totally becomes their life’s mission. The main plotline becomes the Gestapo Inspector Escherich, who is put in charge of trying to find out who the hell is putting these postcards around the place. Now the thing is, that as it happens there are maybe a couple of hundred, or three hundred of these postcards that he writes, and all but 18 are immediately discovered by the Gestapo. So the impact, well, who knows? But why I picked it out for a leadership theme is because it’s a very ordinary couple doing a very extraordinary thing – it is based on a true story – and who knows what the impact was? Probably minimal? Probably futile? But you just don’t know. Eventually they are found and captured – she is killed in a bombing but he gets executed. There is an incredible nobility to them, and yet the couple are not presented as heroic figures, they are just doing one thing that is incredibly brave, and so they emerge at the end with extraordinary nobility. It was written in 1947 and published just after the war, but it wasn’t translated into English until 2009 and it became a bestseller in Britain and America, since when Fallada, a pen name, has become a bit of a cult. 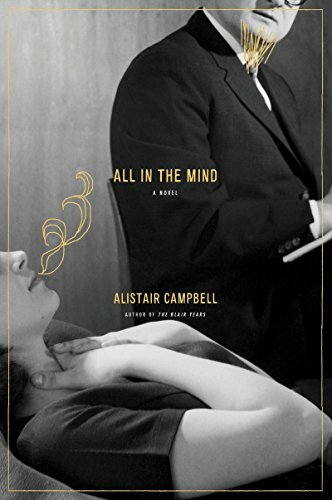 He wrote it in a month and then he died that year – a really mixed-up guy, addicted to morphine, in and out of psychiatric hospitals. He killed someone when he was young. But it is a really amazing book about moral leadership. Bits of it just read like a thriller – when he’s going around terrified of being caught, the terror of being seen leaving these postcards. It’s quite a brutal, violent book and it does give you the sense of what it was like at that time, when everyone was paranoid as well. The idea of how you can show moral courage as an individual is interesting – how you might challenge restrictions on free speech. In one sense we all restrict our freedom of speech all the time. Take Ireland: in Tony’s book [Tony Blair], he virtually admits that you say one thing to the Unionists and then you go and describe the same thing in a totally different way to the other side. And we all do that in our private lives, we do it in diplomatic relations and so forth. But if you speak freely in the world of Alone in Berlin you get shot or locked up. In most countries you have to behave in certain way. Don’t you have to pick your own method of resistance to preserve a sense of yourself? If you imagine yourself into that totalitarian situation, you never know how you would react – would you just crumble? I totally agree. And that’s why I think it is important to read books like this. If you were living in Nazi Germany and you were like this couple, most would just get on with their lives. I mean, what would it have been like to have been a Russian when you really weren’t allowed to say what you thought? I do think in Britain we take so much for granted. I think when you compare the kind of freedoms that we have to the sort of lives that people living under the Nazis lived or people in Burma now, in Zimbabwe, North Korea, Iran. An Iranian friend of mine has told me about the wonderful in-jokes that people exchange in private about the regime. She says the level of private ridicule of public leaders makes it impossible to go back to a strict theocracy. That too is resistance, isn’t it? Perhaps, but it doesn’t bring about change. The truth is none of us knows really how we would behave – I would like to think I would be quite good in the resistance. But the fact is in this country we’ve had fairly stable political debate and we have had our changes made in a totally democratic way. Resistance to totalitarianism, who knows? There have been periods, even in British history, where it would have been so hard to have lived on the wrong side of an argument – but I do like to think that I would have been in the resistance movement.